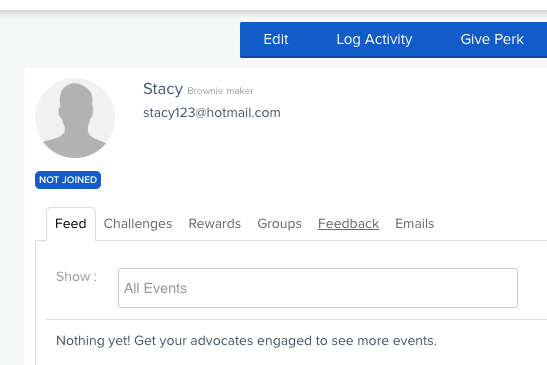 You can use the Import Advocates tool to manage multiple advocates in your AdvocateHub at a time. The tool works by importing a CSV spreadsheet into the system. 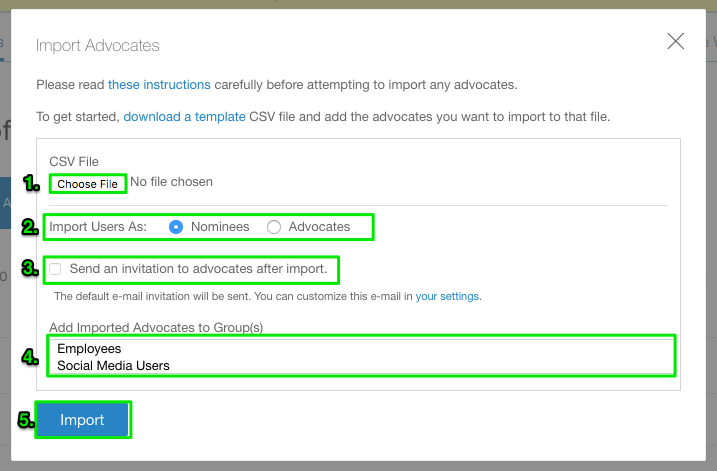 Using a CSV import allows you to invite new advocates, assign new or existing advocates to groups, and to update new or existing advocates' match criteria. The first step to recruiting advocates is to identify customers that have a high likelihood of engaging with you through your program. Your Onboarding Specialist or your CSM will help you build out your personas and give you some pointers on how to segment your unique audience for the purposes of your program. Once you've identified the personas that you will be recruiting, ensure that the information you have about them in your CRM or database is current and relevant. Verify that you have their names, and that their job titles and company information is up-to-date. Also ensure that you have email addresses for all the customers you want to import into the AdvocateHub, as you cannot invite advocates who don't have email addresses. The thing to keep in mind is that when these advocates accept your invitation to join your program, they will see the profile data you have on them in their accounts, and in challenges that contain merge fields. As such, you would want their information to be accurate to provide them the richest and most personalized experience possible. While match category values are not visible to advocates, this data should be up-to-date and accurate as well because you will be using this data to segment challenges and groups in the AdvocateHub. After you have confirmed your list of advocates to recruit and that their information is up-to-date, you should export their data into a comma-delimited CSV file. Please scroll through the file to make sure that it delimited correctly. Before you can import the file into the AdvocateHub, you need to review your exported file and ensure that the data is clean. You can open the file in Excel and remove duplicate rows, remove rows that don't contain customer data (e.g. copyright in the footer), and remove any foreign characters that won't display in the AdvocateHub correctly. Cleaning your data is a critical step to avoid running into any failures at the time of import, so make sure to spend some time on this step. The AdvocateHub can only accept CSV imports that follow the system headers provided on the template. 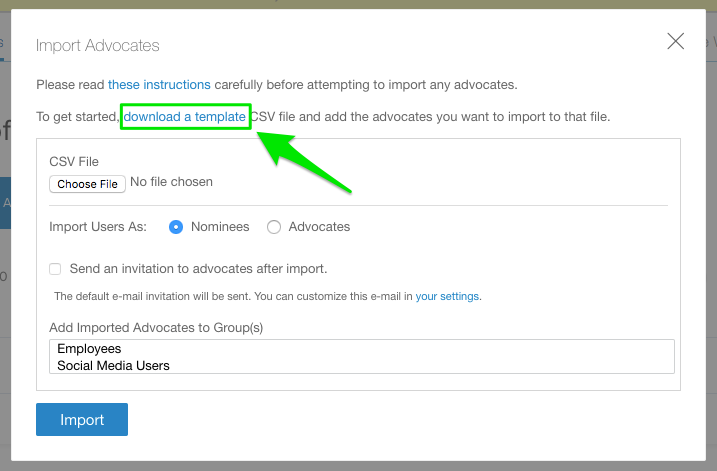 To get a copy of your template, from Admin View, click on the Advocates tab, select Import Advocates (CSV) button. A pop-up window will appear which controls your import settings. Click on the download a template link and save the CSV file to your computer. To add custom headers, you will need to add them as match categories beforehand by following the instructions in the Automatic Customer Data Import (In depth) article. To add multiple values for a match category for a single advocate, be sure to separate the values with a comma and space so that they delimit correctly. For example, if you have a column containing social network information, and you have an advocate who is active on multiple networks, you should list them within the same cell as "Facebook, Twitter, LinkedIn". Once you have the template with all the headers you require, you will need to align them with the data you have in the export you pulled from your database. You can do this either by copy/pasting your data over into the template under the corresponding headers, or vice versa, which is to copy the headers over into your file above the corresponding columns. Once you've compiled your data into the provided template, save the file as a comma-delimited CSV file. Choose File: Click here to select the CSV file from your computer that should be imported. Choose 'Nominees' if you want to add the users to the Nominees List (Members > Invite Contacts button) and send them an invitation to the Hub in the future. Choose 'Advocates' if you want to add the users to the Advocates List and send them an invitation directly after import. Send an invitation to advocates after import: If you're importing a brand new list of customers who are not yet in the AdvocateHub, checking this box will mean that invitation emails will be automatically sent out to them after the import job finishes running. 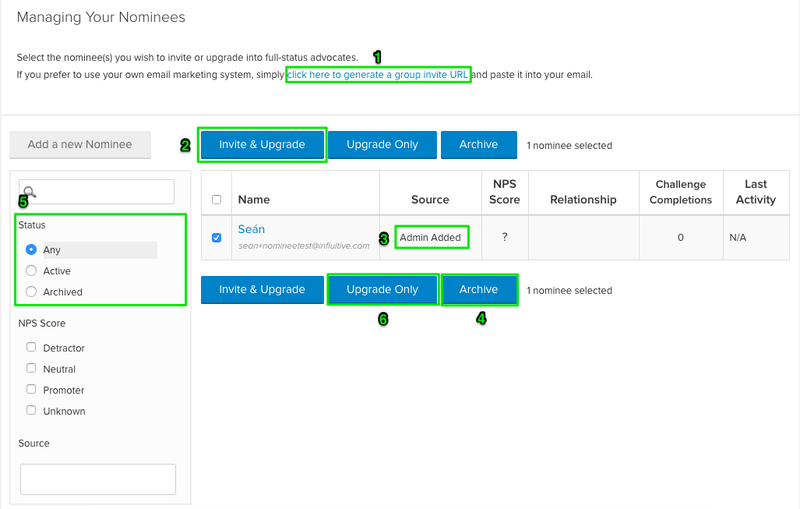 If you are importing a list of existing advocates that has received an invitation before, then checking this box has no effect. Add Imported Advocates to Group(s): Scroll and select the groups you want the list of advocates to be added to upon import. Import: When you've confirmed all your settings, click the Import button. The dialogue window will close, but when you refresh the page, you will notice that the number of Nominees or Advocates will increase accordingly. Email is invalid, Email can't be blank: This message appears next to contacts that were imported without any email addresses. Such contacts will not have any data imported into the system at all until they are re-imported with valid email addresses listed in the 'Email' column. Email is invalid: This message appears next to contacts that were imported with invalid email addresses. Such contacts will not have any data imported into the system at all until they are re-imported with valid email addresses listed in the 'Email' column. Email is already taken: This message appears when the contacts you are attempting to import were already added previously and were sent invitations to join the hub already. You can find these contacts by selecting the "Not joined" filter on the 'Advocates' page. These contacts cannot be sent another invitation through the CSV import function again, and will have to be re-invited manually by visiting their individual profiles. You can however update their match criteria values through the CSV and add them to more groups if you wish. Match values value can't be blank: This is the error message that appears when you have a seemingly blank column that is in fact containing spaces. Spaces without values cannot be imported into the system. To resolve this, simply open your file in Excel, select the blank match category columns and then find all spaces in those columns to replace with nothing. Match values value has already been taken: This error message appears when a match criteria value is repeated for a single contact. For instance, if you were importing data for a John Smith about the match criteria called "Product", and in his values you import "Product A, Product B, Product A, Product C", because you've mentioned Product A twice for John, the system will alert you to the error. All the other unique data for that contact will be imported, and any duplicate match category values will be removed. Match values value is too long (maximum is 255 characters): You can have multiple values for the same match criteria, as long as you use a comma and space to separate the values, and each value is under 255 characters. If you do not enter the comma and space combination, the system will not be able to delimit the individual values correctly, so it will read the whole string as one long value. If any of your match criteria values for a single contact is over the limit, none of the data for that particular contact will be imported. In some cases when the match criteria values are far and beyond the limit, for instance over 500 characters, then the entire import may fail. To resolve this error, check to make sure you don't have any match category values over 255 characters through the use of the len formula in Excel (consult this Microsoft Support article for more details on that formula). FAILED: Invalid Encoding: This is the error message that appears when there are foreign or special characters detected. Special characters are accented letters and symbols. You will need to delete or replace the characters, save and re-upload the list. Here are examples of foreign characters that you can find in csv import: ä ó æ ñ. Extra spaces will also cause this error. Be very careful when combing the file! Invalid header - position, , . Valid headers are...: This error message will usually appear after attempting to upload the CSV file. It will appear when you have manually entered custom headers in the CSV template e.g. company size, industry etc. If you wish for these headers to appear in the template CSV file, you should create them as match categories first by following the instructions in the Automatic Customer Data Import (In depth) article. Once you have created them, download the template CSV file again and these headers will appear by default. As mentioned in Section 4, when using the CSV importer tool, you have the ability to choose whether the hub should automatically send invitations to all the contacts immediately after they've been successfully added to the system. To make sure invite sending is automatic, simply check the box in the import dialogue as illustrated in Section 4. Invitations will be sent from the admin who is marked as the default sender in your hub and the invitation URL will be the one that will add the advocate to the appropriate group upon joining. If you choose not to check this box during the import process, then you will have to manually select the individuals to send the invitations to them afterwards. After your CSV file is imported successfully, the contacts will be listed as nominees (remember, this is if you selected "Import as Nominees", NOT "Import as Advocates"). Either way, you can find the new not-joined members by selecting Invite Contacts under the Members tab on the toolbar. This will take you to the Invite Contacts page, which lists all the contacts that you have added the system, but not yet invited as an advocate. After an invite is sent to a contact upon import or to a nominee after import, that account converts into a not joined advocate account. 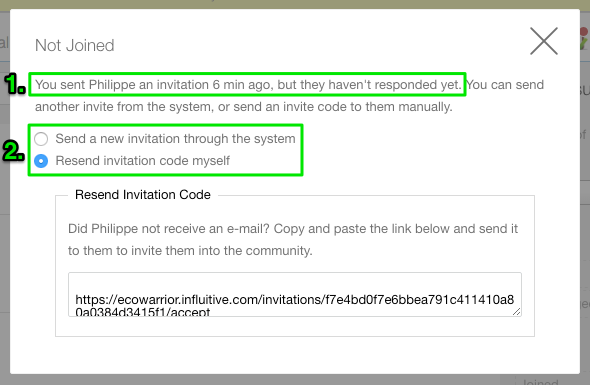 Options on how to re-invite the Not Joined advocate: It can be sent through the hub or the Resend invitation code myself option allows you to hare the Invite URL with the advocate directly through a medium such as email. Once an invited nominee accepts an invitation to the hub and logs into their account, they are then considered a joined advocate. You can find all your joined advocates when you click on Advocates under the Members tab by default. The moment your contacts accept your invitation and join the hub as advocates, they will be added to the groups that you selected at the time when you were importing the CSV file. They will be able to see the challenges, rewards, Communities and Experiences they now meet the targeting rules for. After a group of advocates have joined your hub, you can still use the CSV importer to update their profile information by following the same procedure as outlined above. Remember that our system uses an advocate's email address as the unique identifier. Any changes you make in the profile data or match criteria will be overwritten upon successful import, however importing blank values does not overwrite or erase previously existing data. To erase previously imported data, you will need to do this manually by editing each individual advocate profile, or alternatively you can choose to import a character like an asterisk for all the values you want to overwrite. Also note that you cannot use a CSV import to remove advocates from a group en masse, and you will need to do this manually.